I am looking for advice on displaying weight for each family table instance on my assembly drawing. This weight may be used as a general estimate for product shipping. I have a relation: weight=mp_mass(quotequote) in the assembly model and all part models. I put the relation created parameter 'weight' into the family table. I have had issues with the calculations in the family table. It can require multiple regenerations and family table verifications. In some cases requiring opening and manually regenerating each family table instance. For these reasons, I am exploring other options. I have read several threads about using Creo's built-in mass parameter (pro_mp_mass) instead of the old method mp_mass(quotequote). I have also read tips that a relation created real number parameter should not be used in the family table. I have tried the relation weight=pro_mp_mass in both the assembly and part models. I can recall the parameter within a repeat region table for PART drawings. No problem. Do I in fact need a relation that equals pro_mp_mass or can I call that parameter directly in the repeat region on the drawing? 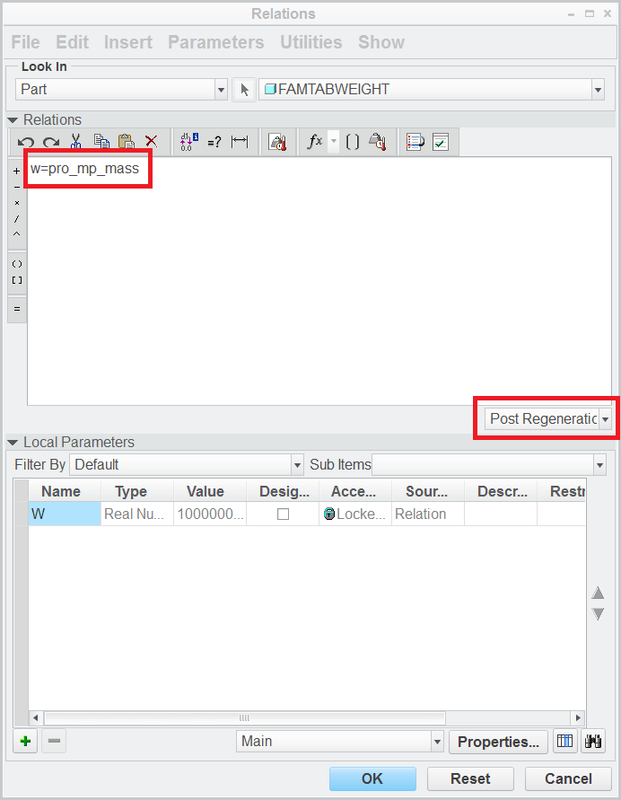 How do you recall the correct report symbol for an instance in an ASSEMBLY drawing repeat region? I am trying this in the assembly drawing and I am unable to figure it out. &asm.mbr. (user defined)weight pulls in the weight value for a single component. I am interested in the entire assembly weight for the family table instance. My table is a single column repeat region (not 2-d). I am currently on Creo 2.0 M110. You should just be able to use &asm.mbr.pro_mp_mass. If you the total assembly mass in the region the assembly has to be listed in the region. There are a couple of other possibilities that depend on how you are wanting to view things. For an instance it should be the same but should update accordingly (should show the correct weight). Thank you for the quick response Kevin! It appears &asm.mbr.pro_mp_mass displays the mass of an single component from the assembly. That is the same issue I am having when I use &asm.mbr.weight where weight=pro_mp_mass as defined from a relation in my assembly model. I am attempting to display the weight of the entire assembly on each family table instance. Recalling &mbr.pro_mp_mass in a repeat region table for the part drawing works OK. Try &pro_mp_mass ESSION_ID. To get the SESSION_ID go to the top level assembly, open the relation dialog, and Show>Session ID>Assembly>Top Level, Creo should display it in the message area. I'd have to look at the units question. you can investigate my example data created in CR2 M070. It is important to define relations properly. You don't actually need a relation to display units, you can create a parameter that has the units definition but it would not be tied to the pro_mp_mass units. You do need one of the methods to display units.